Bill Hubbel is a blue footed booby. His best friend is a crocodile named, Dilly. They work at Gork games on the island of Gondwanaland. Welcome to Gondwanaland, a unique island ruled by those with a carnal instinct, a place very much like our own world, except it is run by animals -- very intelligent animals. Meet Bill Hubbel, a blue-footed booby who you sometimes love and sometimes love to hate. He is selfish and endearing, almost at the same time. His best friend and co-worker – his opposite and nemesis -- happens to be a crocodile named, Dilly. At day’s end, it is usually Hubbel who has learned a life lesson. Follow their daily antics and escapades at Gork Games, where they work, where they play, and where they try to have a social life while building video games. Whether you are carnal, or not. Come hang out with us in Gondwanaland. 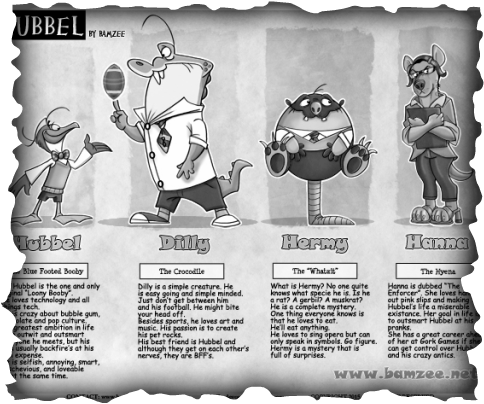 Don't forget to get to know the many quirky friends and foes of Gondwana, including Hanna, Archie, Hermy, Ardimus, Mr. Silver, Boopee, Ronan and Pettles. In Gondwanaland, you can forget about being politically correct. If you need to call someone a big fat pig, they probably are a big fat pig....literally. How about calling your boss a durpy Ape? Yep, go ahead, cuz at Gork Games, the boss is a durpy Ape. How does our modern world relate to the world of a blue footed booby? Find out by reading and supporting my comic, "Hubbel". Follow me here, or see me at Go-Comics Sherpa, or Tapastic! I will be putting my latest 2016 Hubbel comics here. I will be putting my latest 2015 Hubbel comics here. Here are my Hubbel comics from 2012 through 2014.